This help site is based on the available in-product assistance as of April 2019. Please note that this site is provided as a convenience and it does not go through rigorous layout testing. Workflow Constants are globally set values available to all workflows at the specified level (web farm, site collection, or site). Use workflow constants to store credentials, URLs, LDAP paths, SQL connection strings, and any other values that need to be used in multiple workflows. You can insert credentials and other defined workflow constants into workflow actions. During workflow design, the values contained within a workflow constant are not visible; only the name of the workflow constant is shown. Click Select credentials ( ) and then select the credential constant from the lookup dialog box. Note: Credential constants can be used only when workflow actions display the above icon. Credential constants cannot be inserted by either the Insert Reference dialog box or lookups. Use the Insert Reference dialog box or lookups. As an administrator, you can enable or disable entry of manually defined credentials when defining constants or when configuring workflow actions. This setting affects the entire web farm. On the Central Administration Home page, click Nintex Workflow Management and then click Global Settings. On the Global Settings page, under Allow entry of user credentials, select the desired option and then click OK.
Constants page only: Allows entry of manually defined credentials in the Manage workflow constants page but not during configuration of workflow actions. Constants page and action dialog: Allows entry of manually defined credentials both in the Manage workflow constants page and in the action configuration dialog box. Neither: Does not allow entry of manually defined credentials in either the Manage workflow constants page or the action configuration dialog box. As an administrator, you can create, edit, and delete workflow constants using the Manage workflow constants settings page for the specified level (web farm, site collection, or site). Credentials can be defined through either manual entry (if enabled on the web farm) or the Secure Store Service on SharePoint. For more information about Secure Store Service on SharePoint, see the Microsoft article Configure the Secure Store Service in SharePoint 2013. Access the Manage workflow constants page for the desired level (web farm, site collection, or site). Web farm level: On the Central Administration Home page, click Nintex Workflow Management and then click Manage workflow constants. Site collection level: Do the following. From the top site level home page, click Settings ( ) and then click Site Settings. Under Nintex Workflow, click Manage workflow constants. In the Workflow constants ribbon, click Site collection settings. Site level: Do the following. To create a new workflow constant, click New in the Workflow constants ribbon, define properties, and save changes. To edit an existing workflow constant, select the constant and then click Edit in the Workflow constants ribbon. To delete a workflow constant, select the constant and then click Delete in the Workflow constants ribbon. You can edit permissions for workflow constants to allow only specified users and groups to see and use the workflow constant when designing a workflow. Permissions are checked when the workflow is published. Note: If an existing workflow is modified by another workflow designer who does not have permissions to see and use a workflow constant being used in that workflow, then the workflow will save; however, republishing of the workflow will not be allowed. Only workflow designers who have been granted permission to see and use the workflow constant will be able to publish the workflow. Because this security check is performed when the workflow is published, no currently published workflow using workflow constants can be re-published by someone without permissions to the referenced workflow constants. Therefore, if the permissions for a workflow constant are changed, a workflow that is already using the constant will continue to use the value successfully. From the top site level home page, click Site Actions and then click Site Settings. Select the constant for which you want to edit permissions. In the Workflow constants ribbon, click Edit permissions. In the Edit Workflow Constant Permissions dialog box, under Permissions, select an option. If you selected the option Specific users, then under Users/Groups, specify users and groups to have permissions to the current worklfow constant. The Add Workflow Constant dialog box contains the following fields. This dialog box is accessed by administrators when adding workflow constants. ​Name ​The name of the constant to display for insertion into the workflow action. ​The data type of the workflow constant. Select one of the following options. String: A value used to replace the constant when the workflow is run. Number: A numeric value used to replace the constant when the workflow is run. Date: A date value used to replace the constant when the workflow is run. Credential: Values for a username and password credential pair. Use this constant type to provide workflow designers with access to external systems needed by workflows while keeping the actual values private. User Supplied Credential: Manually enter the following values for secure, encrypted storage. Note: This option is available only when entry of manually defined credentials is enabled for the web farm. Username: The username value used to replace the Username part of the credential constant when the workflow is run. If entering an AD username, remember to include the domain. Password: The password value used to replace the Password part of the credential constant when the workflow is run. Enter the password corresponding to the above username. Secure Store Credential: Reference username and password values associated with a target application defined in the Secure Store Service on SharePoint. For more information about Secure Store Service on SharePoint, see the Microsoft article Configure the Secure Store Service in SharePoint 2013. Target Application ID: The unique identifier of the target application (Target Application ID property in the target application settings). Secure string: A text value for use in workflow action input fields that do not show the value to the workflow designer. The value is also masked in the constant management page. Use this constant data type for security tokens needed to connect to Nintex Live-enabled workflow actions. Description ​Additional notes about this constant. ​Sensitive ​(Available for the workflow constant types String, Number, and Date.) When this check box is selected, the value of this constant is encrypted, the value is masked to the workflow designer, and the constant is available only in workflow actions that use sensitive values. 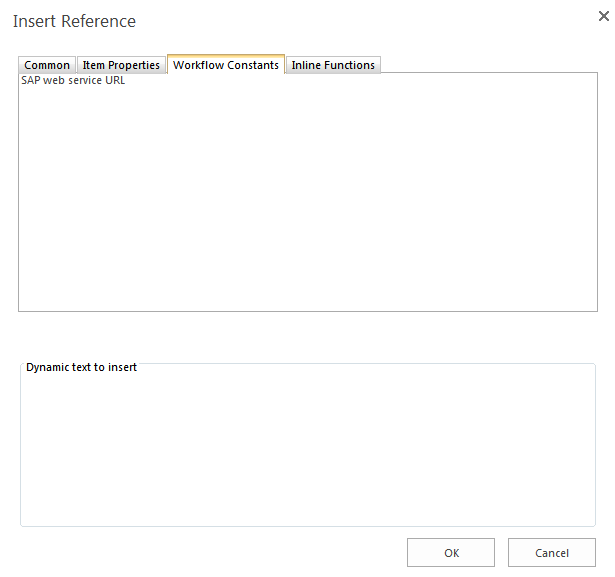 For example, sensitive constants are supported in the connection string field of the action Execute SQL but not the body and subject fields of the action Send a notification.